A "field pie" is really just a semi-open, free-form pie with fresh ingredients lightening the top. 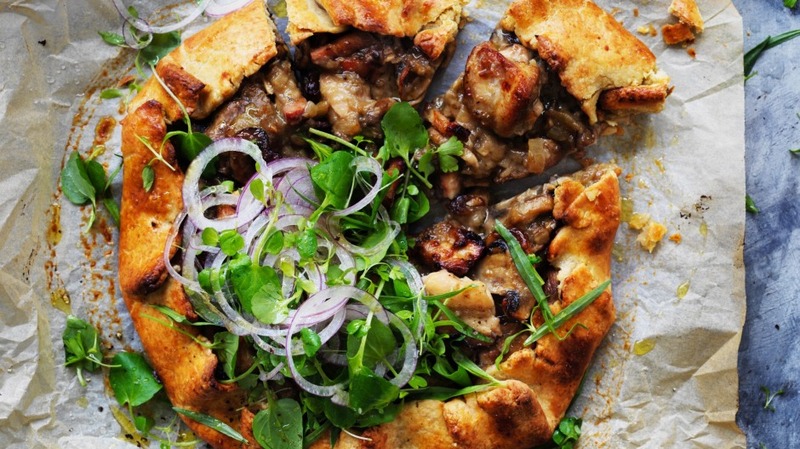 It combines buttery pastry, rich fillings and salad for a complete meal. 1. Heat half the olive oil in a large frying pan over high heat and fry the speck (or bacon) until lightly browned. Remove from the pan and set aside. Season the chicken thighs well with salt and pepper and fry in batches until lightly browned, then remove from the pan and set aside. Add the remainder of the oil to the pan as well as the onion and garlic and fry until lightly browned, then add the mushrooms and fry for about five minutes, until browned. Add the flour and stir well. Add the white wine and stock and return the chicken and speck to the pan. Simmer for 5-10 minutes until thickened. Allow to cool to room temperature. 2. For the shortcrust pastry, combine the flours, salt and butter in a food processor and process until they resemble coarse breadcrumbs. Add 1-2 tablespoons of cold water a little at a time and pulse until the mixture comes together in a mass. Lightly knead a few times to form a consistent dough, wrap in cling film and refrigerate for 20 minutes. 3. Heat your oven to 220C. Roll the pastry out on a lined baking sheet to around 5mm thickness. Place the cooled filling in the centre and roughly fold the edges of the pastry up around the edges of the pie, slightly overlapping the top. Brush the pastry with beaten egg and bake for around 25 minutes until the pastry is nicely browned. Allow to cool slightly. 4. Combine the salad leaves, herbs and onion and toss with a little olive oil first, then with a squeeze of lemon juice. Season with a little salt and pepper. Top the pie with the salad and serve immediately. Serving suggestion: serve with Adam Liaw's wine-poached beetroot with mustard cream on the side.